Adelaide Elise Barnes, MD, is Assistant Program Director of the Pediatrics Residency Program at Children's Hospital of Philadelphia. 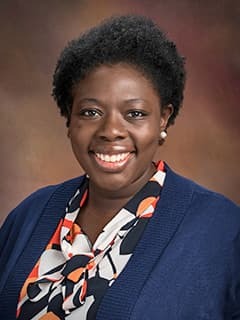 Adelaide Barnes, MD is an Assistant Professor of Clinical Pediatrics within the Section of Hospital Medicine at The Children’s Hospital of Philadelphia. Adelaide received her Bachelor of Arts in Sociology from Duke University and obtained her Medical Doctorate from The George Washington University School of Medicine and Health Sciences. She completed her pediatric residency training at The Children’s Hospital of Philadelphia. After completing residency, she served as a Pediatric Chief Resident for the Hospital and the Pediatrics Residency Program. Adelaide remains active in the Pediatrics Residency Program, serving as an Assistant Program Director and Chair of the Intern Selection Committee, a mentor to residents, and a facilitator for the Professionalism series. She serves as the global health liaison between the Pediatrics Residency Program and CHOP’s Global Health Center and oversees pediatric resident global health activities. She also sits on the Hospital Diversity Council and serves as a faculty mentor to the Multicultural Physicians’ Alliance, an organization at CHOP comprised of underrepresented minority residents, fellows, and attending physicians who are committed to creating a diverse workforce that affords the best and most culturally competent care to CHOP’s patients and families. Mazzeo P, Barnes A, Haas L, et al. A Multidisciplinary Effort to Improve Time to Blood Culture Collection: Sepsis Medical/Surgical Unit Working Group. Presented at: Quality and Patient Safety Day, Children’s Hospital of Philadelphia; 2015 Mar 13; Philadelphia, PA.
Barnes A. A Multidisciplinary Effort to Improve Time to Blood Culture Collection: Sepsis Medical/Surgical Unit Working Group. Platform presentation at: Quality and Patient Safety Day, Children’s Hospital of Philadelphia; 2015 Mar 13; Philadelphia, PA.